Booking amount 30% Total cost. Local Space brings you finest and best Farm House and Farm Land in Bangalore with club membership under the foothills of Shivaganga and Kengal Hills. Located 55 kms from Yeshwantpur Bangalore and 3kms from Dabaspet on Bangalore-Tumkur Highway road. 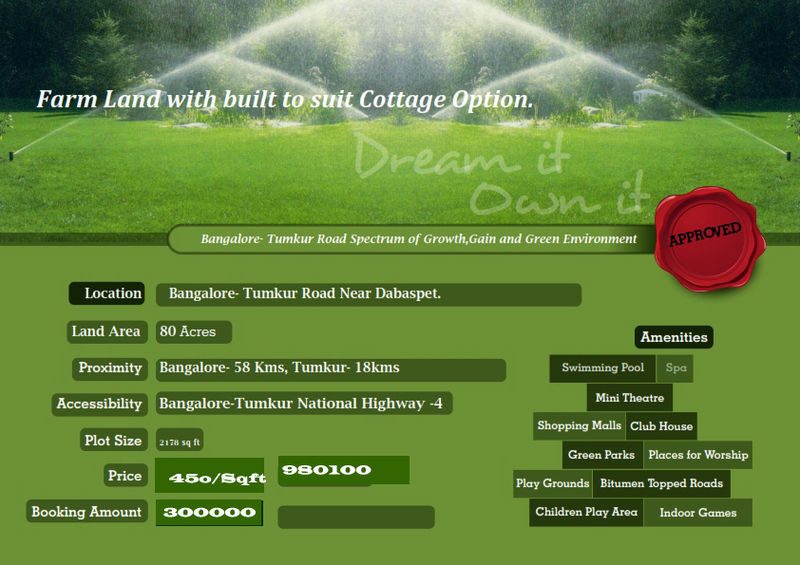 Unique opportunity to own Farm Land and Resorts membership in Bangalore. Resorts in Bangalore are common. But owning a farm land in Resort is specially made for you. Under the foot hills of natural and holy serenity Shivaganga and Rocking Kengal. The sparkling background of nature’s beauty and privately held gated community farm land plots with built to suit cottage option. For Details call : 09035611299. The Mumbai-Bangalore Corridor is likely to have exponential growth in residential, commercial and industrial segments along Bangalore-Tumkur National Highway NH4. Why one should invest in the Bangalore-Tumkur Corridor. 1 Elevated Express and Flyover connectivity from Bangalore to Tumkur. 7 The likely investment into the zone is Rs 50,000 crore under NIMZ. 8 Estimated 2.5 lakh jobs, direct and indirect once MIMZ project completed. 9 The shifting of the Peenya industrial belt to Dobbaspet is also going to help Dobbaspet and surrounding area picking up its industrial activity.